Envato is committed to helping people earn and learn online. We provide a wealth of educational material through Tuts+ and Tuts+ Premium, alongside the Envato Marketplaces to help you benefit from the creative skills you learn. Tuts+ Jobs furthers this vision perfectly. With Tuts+ you can learn the skills you need to become a creative professional, and with Tuts+ Jobs you can find an amazing job that uses those skills. Our goal here is to take the hassle out of finding a job, so we’ve made the process as simple as can be! With Tuts+ Jobs we’re committed to making every step of the job-finding process more intuitive, simpler and more efficient. We don’t want to stand between you and a great opportunity. It’s totally free to sign up and start applying for jobs, and if nothing matches your initial search you can receive notifications when jobs come up that match your criteria. We will have full time, part time and casual listings from all around the world. Check the listing to find out where the job is based, as some jobs may offer remote opportunities. If you have a position that you need to fill, or a great part/full-time opportunity, then Tuts+ Jobs is the best way to find a talented and creative individual to do that job. Each 30-day listing costs just $99, regardless of the type of job you’re posting. Your job listing will be promoted across the entire Tuts+ network. With exposure to our ten million visitors over the course of 30 days, it’s a brilliant way to reach exactly the type of audience you’re looking for. We’re so confident you’ll find the person you’ve been looking for that if, at the end of the 30 days, you haven’t found the right person you can re-list your job for free or get a full refund under our money back guarantee. 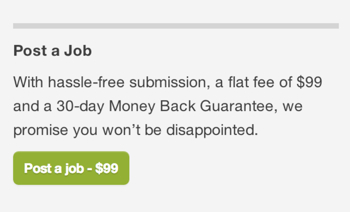 At present Tuts+ Jobs doesn’t offer freelance opportunities, it’s for part/full-time jobs only, but we still have our sister site, FreelanceSwitch, for freelance work. We will be merging both of these sites in the future so Tuts+ Jobs will cover every type of opportunity — from temporary freelance gigs, to high-level full-time positions. In the meantime, FreelanceSwitch is the place to go for smaller freelance projects! We’ll be posting plenty of exciting job positions over the next few weeks, so now is the best time to head over to the site and subscribe to a job search that interests you. That way you’ll be the first to know when any new listings show up that match your skill set and requirements.